Cats love to chew on many things, especially plants and flowers. Our little explorers will jump to great heights if something looks enticing to them. 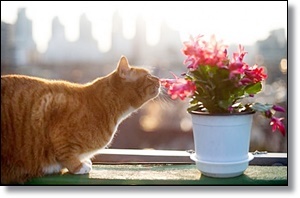 Therefore, if you like to have plants or flowers at home either inside or outside, it’s important to know which plants or flowers are poisonous to cats. If a plant or flower is poisonous, than parts of the plant are poisonous even if some parts of the plant have higher concentrations of the toxic source than others. Many toxic plant and flowers are irritants: they cause inflammation of the skin, mouth, stomach, and some might affect a particular organ like the kidney or heart.